Building and maintaining a successful team is no simple task. Even people who have taken their teams to the highest level in their field have difficulty recreating what accounted for their successes. Is it a strong work ethic? Is it “chemistry”? What tools can you wrap your hands around to build–or rebuild–your team? 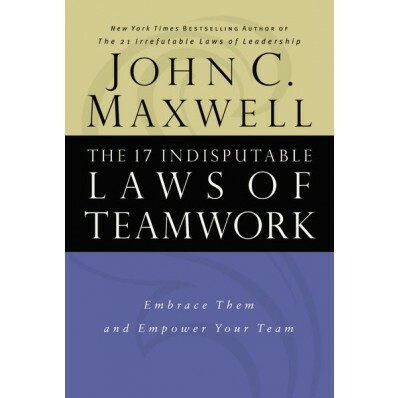 In The 17 Indisputable Laws of Teamwork, leadership expert and New York Times bestselling author John C. Maxwell shares the vital principles of team building that are necessary for success in your business, family, church, or organization. In his practical, down-to-earth style, Dr. Maxwell shows how: The Law of High Morale inspired a 50 year-old man who couldn’t even swim to train for the toughest triathlon in the world. The Law of the Big Picture prompted a former U.S. president to travel crosscountry by bus, sleep in a basement, and do manual labor. Playing by The Law of the Scoreboard enabled one Web-based company to keep growing and making money while thousands of other Internet businesses failed. Ignoring The Law of the Price Tag caused one of the world’s largest retailers to close its doors after 128 years in business. The 17 Indisputable Laws of Teamwork will empower you–whether coach or player, teacher or student, CEO or non-profit volunteer–with the “how-tos” and attitudes for building a successful team.